Any quantity only $34.99 per coin over spot! The polar bear is one of North America’s largest land mammals, and is found exclusively within the Arctic Circle range in the US state of Alaska and the northern provinces of Canada. Featured on previous Canadian coinage, the polar bear enjoyed significant attention on the face of various Royal Canadian Mint products in 2015. The 2015 1/4 oz $10 Gold Canadian Polar Bear and Cub Coin is available to you online today at Silver.com. Ships to you inside of a protective capsule. One of several Polar Bear and Cub releases in 2015! Consists of One-Quarter Troy oz of .9999 fine gold in BU condition. Reverse features the image of a polar bear sow and its cub. Found throughout the Arctic Circle, the polar bear is uniquely adapted to life in these harsh, frigid environments. The carnivores live on seals and Arctic Foxes for meat, and often move between landmasses and the floating masses of ice in the waters of the Arctic Ocean. Related to the brown bear species, polar bears have several unique adaptations that give them a visible difference to their sister species. Polar bears have larger, padded paws that enable them to swim efficiently compared to brown bears, and have longer snouts and skull shapes than the brown bear. Of course, the most noticeable difference is their white fur. Their fur isn’t actually white. Instead, their hair shafts are often transparent and hollow giving the impression of a white coat. 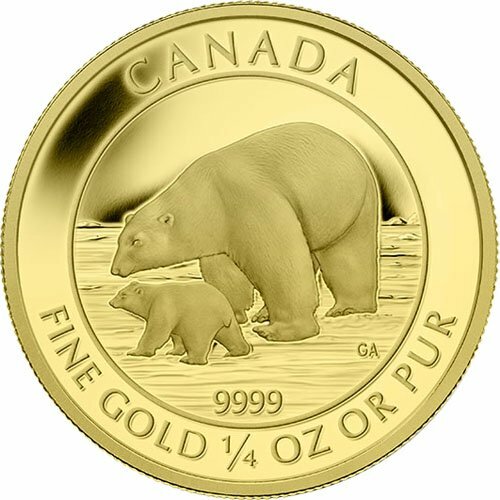 On the reverse of the 2015 1/4 oz $10 Gold Canadian Polar Bear and Cub coin you’ll notice the image of a polar bear sow and its cub walking along the frozen tundras of the Arctic Circle. A sow is a female polar bear. Sows are often half the size of their boar, male, counterparts who can weigh in excess of 1,500 lbs. 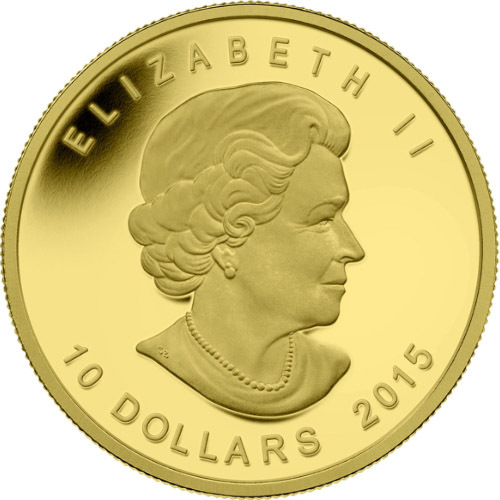 The obverse of all Gold Canadian Polar Bear and Cub coins includes the right-profile portrait of Queen Elizabeth II. This is the latest effigy of Her Majesty for Canadian coinage. Created in 2003 by Susanna Blunt, this design began to appear on Canadian coins a year later in 2004. The Royal Canadian Mint was founded in 1908 to give the young nation independent control over its coinage from Britain. Its original facility opened in the federal capital city of Ottawa that year, with a second facility opened in Winnipeg by the 1980s. We encourage Silver.com customers to contact us with questions. You can reach us on the phone at 888-989-7223, chat with us live online, or simply send us an email with your inquiries. Don’t forget you can find the current price of silver updated throughout the day on our homepage!